Two theologians, one with a background in science and the other with a background in philosophy and culture, engage in a probing dialogue about the central beliefs of the Christian faith. Each writes of his approach to God the Creator, Jesus and the Holy Spirit, and together they cover such topics as faith and reason, unseen realities and motivated belief, divine power and human freedom. 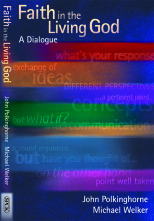 This dialogue, in which Polkinghorne and Welker take turns, first to explain their position, and then to respond to the other, gives us a unique opportunity to engage with these issues and to relate them to the scientific and cultural background of our times. Their concern is for truth rather than polemics. They seek to anchor their thought in concrete particulars, rather than abstract generalisations. They ask the questions that trouble the enquiring mind, and meet head-on the challenge, as well as the reassurances of belief. John Polkinghorne is a former Professor of Mathematical Physics, a Fellow of Queens’ College, Cambridge and of the Royal Society. He is a key figure in the science and theology debate, and has written many popular books on the subject. Michael Welker is Professor of Systematic Theology and Director of the Internationales Wissenschaftsforum at the University of Heidelberg. He is also a Fellow of the Center of Theological Inquiry, Princeton. Many of his books, which include God the Spirit (Fortress), have been translated into English.